It’s almost the Fourth of July (one of our favorite holidays)! We were thinking that we wanted to do some sort of patriotic recipe (obviously). Then it dawned on us! We’re geeks, we need to do a Captain America inspired recipe (we still don’t buy that he’s a Hydra double agent). With the plethora of fruit trays, fruit kebabs, and traditional cakes, we asked ourselves how we could be different. The answer came to us while we were out shopping, Scoopable Cake! 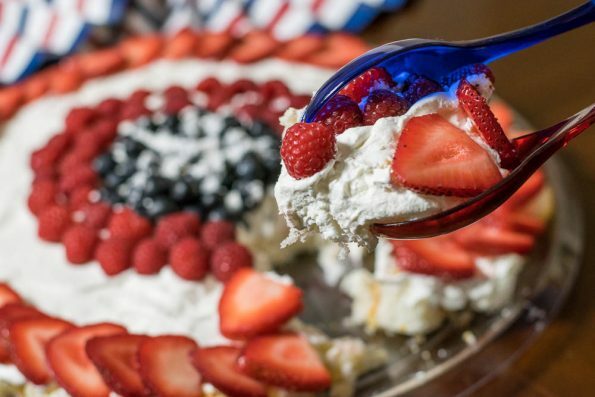 Thus the Star Spangled Scoopable Cake was born (try saying that 3 times fast)! We were thinking how much of a pain it is to cut a cake when you are at a party. Basically one person has to be a designated cake cutter to make sure pieces are even and what not. Scoopable cake can be self served and then someone who wants “a large piece” can serve themselves a helping as big as they want. The same for someone who just wants a taste. 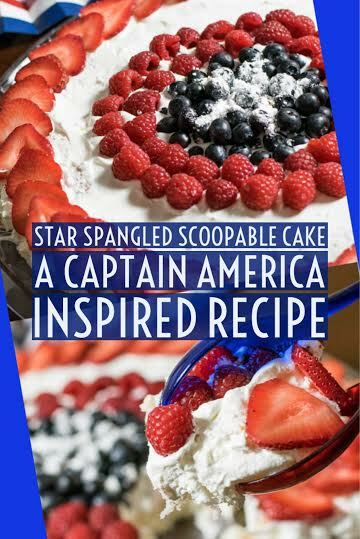 The Star Spangled Scoopable Cake is easy to make as it uses pre-made ingredients. However, that being said, if you prefer making your own cake and whipped cream, you can! That is the beauty of this cake. Also, if Captain America isn’t your thing (you may be at the wrong site in that case), you can also use the berries in any pattern you prefer. The world is your oyster, be creative and enjoy! How will you be celebrating the 4th this year? Do you think Steve Rogers is really a Hydra double agent? We’d love to hear all about it! Leave your comments below or use the hash tag #GeekEats! We’d also love to share your photos of our recipes so be sure to tag us! Happy Independence Day! Arrange cubes in tray, sort of pushing them together towards the center. Do not mash them (be gentle). Arrange your raspberries in a circle around the blueberries. Make 2 rows of raspberries. Lay stencil over blueberries and sprinkle powdered sugar. Be sure to sprinkle from higher up so that your stencil edges are crisper. Do not use the aerosol whipped cream. It will "melt" when you try to spread it. Also, the amounts of berries we used were based on a 16" party platter we purchased at Party City as well as the Captain America design. 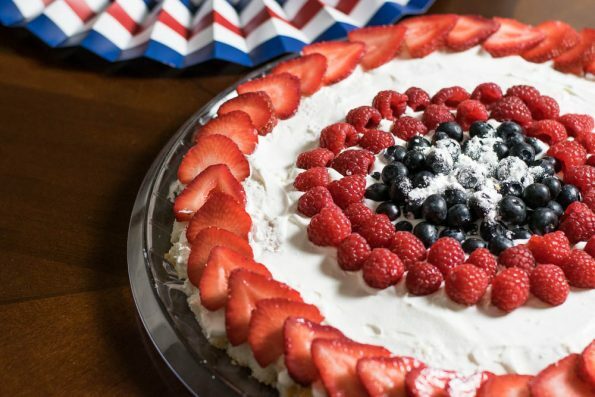 If you choose to just go the Patriotic route any amount of berries can be used. The cake decoration is amazing. It looks easy to prepare but so delicious, great recipe! This one looks so good!!! !